I am determined to have a relatively clean house. I am determined to eliminate most of the clutter. I am sick of the constant mess my mess makers leave behind. Part of the problem is that I am bad at maintenance, my husband is bad at maintenance, and thus so are our children. 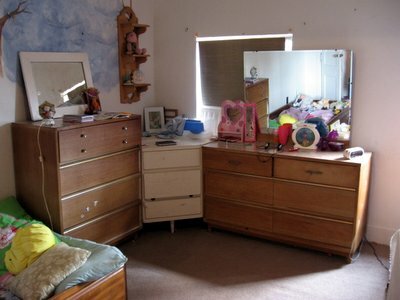 I am very good at doing a big clean up and getting a room to look good for a day or two, maybe even a week if the kids are spending all their time outside. The problem is that once a room is clean the kids descend on it like bees to honey and promptly play there until there is a huge mess. They then move to another location to play instead of cleaning up their mess. Since I am often occupied elsewhere when this occurs I don’t realize it until later and by then they are off somewhere else making new messed. 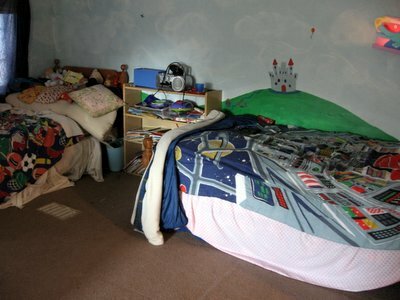 And if the place has already been relatively messy? Well, then I don’t even notice the new mess. You see my husband and I are both project people. He is a left-brained thinker–always a list and he is motivated by what is on that list. His list includes all his work projects, exercise, eating, and his office. He stays focused on that list and doesn’t notice what is outside that list–unless he steps in something wet or has to step over toys or search for a clean dish. This is why my main goal is keeping his path clear (and he has a set path) so that he can focus on his work. Occasionally he will notice something beyond what is in his path–which is usually when we kick things into cleaning gear. I on the other hand am a right-brained work by association sort. I don’t have a list I have a spiderweb of things I need to do with each associated to other things on the list.When I am tired or achy or getting sick then I want a clean house. I want things organized so I don’t have to worry about a bigger mess. Other times I am too focused on my current project to notice the rest of the mess. My brain doesn’t do lists and schedules–I have top work very,very hard to remember things when they are organized that way. Flylady doesn’t work for me–I resent being told to go clean my closet when I have other more pressing things that need done. I have realized that instead of trying to force myself to keep on top of our rather large house (the rooms are rather big and we have a huge basement) I need to train my mess makers to clean up after themselves. Since they think similarly to their parents who don’t notice mess unless it is in the way of a project, that means I need to train them to see the mess first so they can clean it uip immediately. Which means that I need to notice it as well. One trick I have learned over the years is to pray. I literally have to pray that my eyes would be open to see the mess as others see it. Suddenly I see things I hadn’t noticed. I also need to withhold privileges and reserve the right to stop the kids from doing anything else until they have dealt with the mess. I hate making them stop what they are doing just to clean up a mess, especially since it is usually something very interesting and creative that they are doing but I need to be determined and make sure to keep up with them and if I do then they will eventually learn. It is not as simple as just instilling a habit would normally be since the older two have learning disabilities that keep simple repetition from teaching–there has to be more to it and it takes longer than it would with a typical person.I also need to continually attack the clutter. With a big house and lots of grandparents every holiday adds to the clutter.You can’t just get rid of stuff and be done. Right now I am praising the Lord that my mother-in-law got the kids each a beach towel and that is all for Easter. Everyone else got them tons of random junk that they didn’t need and which is making its way at this very moment into the yard sale bags. The clutterific gifts have been on the decline but they are still too much. Even if each set of grandparent only bought the kids each one thing for each holiday that would be 60 new things a year. And most of the grands buy more, much more. My kids do not need 60 new things each year!!! IT is too much!!! And those 60 don’t take into account all the little random stuff that show up at our house when they are decluttering their stuff and all the other stuff they ask for when we stop at the thrift shop. No wonder we have too much! We are working on it. Maybe it is time to halve all our stuff again? We do that every few years and it helps. We have 10 garbage bags full of toys and clothes that the kids want to use in a yard sale–I know there is more, much more to be rid of. Too much is too much. 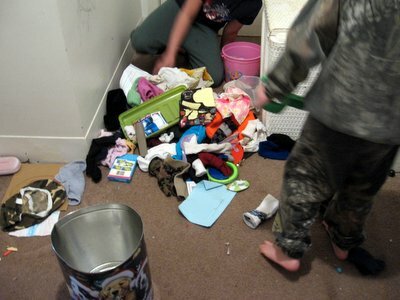 Right now the kids are working on cleaning up their upstairs hallway. 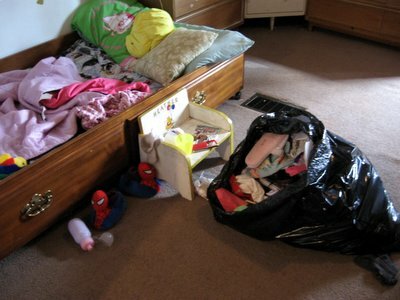 It is full of random little toys and stuff that needs dealt with. Yesterday we attacked their rooms. They were trashed and ready to implode. Earlier this week we cleaned downstairs and everythig is already undone because they kept playing down here. I am getting in the “clean out – throw away” mode. I can tell spring is coming! Now, I do love Fly Lady, but as much as I WANTED it to work for me, it doesn’t. Most of the time. I think I am too much like you. I need to have some order in the MAIN part of my house. I have trained them to keep their rooms clean and my living room always looks good. Now, don’t open the closet… 🙂 Fly Lady wouldn’t like that. Sounds like you’re doing some spring cleaning! A good “cleanse” as it were. I agree that kids don’t need all that stuff (I talk the talk, but don’t always walk the walk on that one…) I’m pretty uptight about keeping things picked up. It doesn’t have to be shiny sparkly clean, but neat, picked up and semi germ free. On the other hand…you know, the other day I was fixated on a clean house…then I got a peak on a friends life and some very tragic news. YOu know, my house didn’t matter anymore. I want it clean for company, but you know what? We are alive, healthy and happy with projects and “stuff”. Our home reflects that and I was so, so, so thankful. If I could just keep that in mind more often…perspective. Are you my sister? I do have a sister named Heather, you know. 🙂 This sounds a whole lot like my family and how each of us operates. My biggest challege is being consistent in my child-training.